Two things happened this week, the new iPad was released and the Immergo rolled into my classroom. A multi-touch surface that can act as both a vertical screen and a flat table, it came in as the latest and greatest tool for learning that every classroom needs, on loan for a week. It is similar to the screen used in the modern remake of the television show, Hawaii Five O. Described on the website as the ‘next generation solutions for the classroom’, it got me thinking what was the problem that was needed to be solved and is the Immergo really the solution. Again the old chestnut came to mind, what comes first: the pedagogy or the technology. I have spoken about this before when I looked at the way we learn. What concerned me last time was you couldn’t deal with ways of thinking without also addressing how we work and the tools we use. I think much the same can be said about addressing the tools for working in the 21st Century. In his fantastic keynote for the 2011 ICTEV Conference, +Tom March spoke about the importance of refocusing education around learning and moving away from all the inhibiting factors, such as time and space. He describes technology as the real game changer, the enabler in all of this. Associated with this, he spoke about the danger of eternally waiting to jump on board the latest developments in technology, warning that there will always be something to replace what you are using today. At some point you really need to grapple with what you have. Instead of forever waiting for the next technological change, March suggested that we need to embrace organisational change, open the classroom to the world. For at the heart of it, what technology can do has not really changed in the last fifteen years (a point also made more recently by +Chris Betcher at the 2013 Melbourne Google Summit), what has changed is the way we use it. However, unlike in the early days, where everything was open, now we block sites, banned devices and poor bandwidth. Continuing the argument popularised through the TED talks by Sir Ken Robinson, March suggested that we need to move away from the constraints imposed by schools and instead focus on the possibilities of authentic learning. I am left to wonder, are devices such as the Immergo the real game changer – the ‘next generation solution’ – that everyone has been waiting for, or is the real solution already here simply waiting for us to embrace and engage with it? Developed by glass manufacturer, Corning, the videos provide a snapshot of a future where everything is made out of smart glass, making every surface interactive and to be engaged with. In one scene a whole class of students stood around a glass table that had been turned in a touch screen and were experimenting with different colour combinations. It begs the question, is the image created by Corning really the future or just an elongated advertising campaign? Let me then outline some of the uses and abuses that I observed associated the Immergo. Firstly, unlike the surface in either the Corning advertisement or Hawaii Five O, the Immegio doesn’t allow a whole class to comfortably stand around it. When I tried to get my class all around it, I couldn’t fit much more than six or so students, until it got rather squashy (and they were middle years students, I would hate to see how many senior students, let alone adults, would fit?) In addition to this, many of the apps had a decisive top and bottom of the screen, meaning that some students were disadvantaged. Don’t ask about the cable. Associated with this, the great utopian desire to decentralize the classroom and place more focus on the learner is only partially achieved. For although the surface can be moved around the room to where it is needed, due to its slightly cumbersome size, it simply creates a new focal point in the room. Although this may no longer be at the front of the room, it still creates a new centre, therefore, in my view, only temporarily alleviating the original problem. The biggest concern I have is with the applications. Maybe I am just not imaginative enough or just restricted by the limitations of a demonstration model, but I don’t believe that any of the applications offered within the interactive surface really provided for the creation of new original tasks, let alone the significant redefinition of current ones. For example, one of the applications allowed you to take apart a 3D model. It is pretty cool and offers a perspective that was previously unavailable. However, unless, as Tom March pointed out, there was a significant change in the way learning happens in the classroom, to me nothing much has really changed. For a new tool or program does not automatically constitute a new pedagogy. I find it interesting to compare the Immergo with the ActivBoard Touch. Like the Immergo, the Touch also offers the potential to have multiple students interact with the board at once, not just write on it like traditional ActivBoards, which are dependant on the pen. 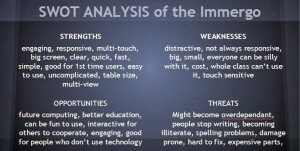 I remember hearing Peter Kent talk on behalf of Promethean, at a presentation for the Touch about the potential for engaging students by creating content that they can manipulate, whether this be images, shapes or text. Getting them up to the screen and adding their own voice and opinion to the content. The Immergo offers much the same experience. What is most interesting though is that I have not really seen many teachers actually do this with ActivBoards, so why would they all the sudden change with the arrival of a new device offering much of the same capabilities. I think that if these applications were going to find any use, it would be in the early years. However, in the middle years, and especially in secondary school, I question whether these ‘collaborative’ applications would really be that effective. Returning to Tom March, he suggested that we need to skate to where the puck is going to be, which is personalised learning, not simply play school at the front of the classroom. I question whether the Immergo really changes any of that. Often when ICT companies come in and spruik or some advertisement for some schmick professional development is placed on our desks, there is a perception that the new shiny device on display is the only future possible. However, as I have written elsewhere, what is often ignored is that there is always a choice. So here are some of the options that are an alternative to jumping on the next best thing. Stick to What You Know: It may seem stupid, but the first option is surely to better utilise the technology already around before getting rid of the supposed dead horse that has been flogged to death. I remember hearing of a school that removed all whiteboards to force teachers to utilise the IWB’s in their classroom. Now I am not necessarily agreeing with such measures, but maybe we need deal with the flog, before simply getting another new horse. Lead Learners: Associated with the LCD screens, why not install an Apple TV and provide each teacher with an iPad to manage it. Not being in a 1 to 1 iPad school, this solution would not be the best fit. However, having a device that could be passed around means that although there is central spot in the classroom, defined by the screen, it does not mean that it needs to be necessarily operated by a teacher (or student) on the stage. For example, I recently came across an app from THIX called Chemist. What it allows you to do is conduct virtual experiments. I could imagine passing this around a science class and allowing different student to test out their own hypothesises. In addition to controlling the screen, the iPad then offers an opportunity to work with students in small groups. Although the screen is not as big as the Immergo, it has the potential to go where the learning is, whether it be in a small meeting room or out on the oval. Also, if the issue is bang for your buck then buying every teacher an iPad is priceless. Can you remember the last time you saw a teacher take an IWB home on the weekend to continue their learning? Scrap the Digital: This may seem strange, but maybe something is lost in moving everything to the digital. If so many staff are rebelling against the sometimes fiddly nature of using an IWB, maybe we need to return to the board. I was inspired by Jak at the Google Summit to reconsider how I take notes. There are times when you just need to get messy, write things down and scribble things out, and an IWB just doesn’t suffice. 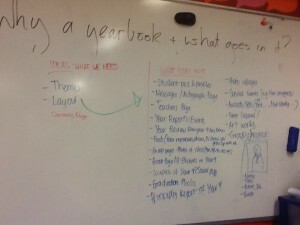 I have actually had a bit of a ‘return to the board’ recently with some of my students developing a yearbook. They feel more comfortable using the whiteboard and in order to capture this information, simply using the camera on my iPad to keep a record of everything as they go. I am sure that if I spent more time with it that I would find some purpose – to be honest, if you spend enough time with any piece of technology, you will always find a use for it. However, at present I do not think that it is a solution truly required at this time. If we are to worry at all about the ‘next generation’, let’s start with the next generation of learning, for that is where the real change needs to happen. Looking for the ‘Next Generation Solution’ for Technology by Aaron Davis is licensed under a Creative Commons Attribution-ShareAlike 4.0 International License.